When you get into BAR LUCE, you could expect Bill Murray sitting next to you wearing a pair of round glasses and drinking a whiskey whilst reading the newspaper. 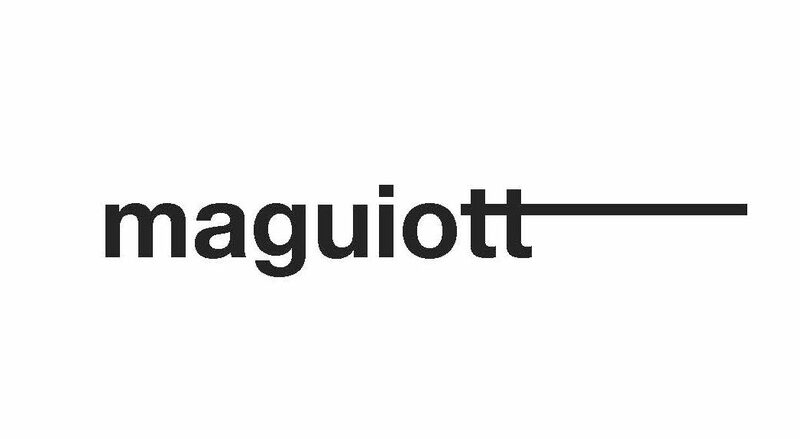 And it could certainly be announced in Future Bold. You can feel a bit overwhelmed when entering in such a scene, at least if you’ve seen Wes Anderson’s filmography. 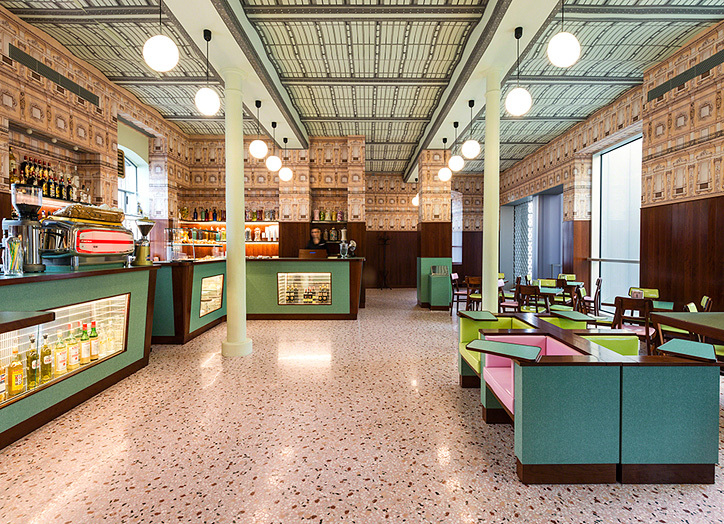 The reflection of his universe in this project – designed by the cinema director – gathers the iconographic of Italian popular culture in a recreation of a typical Milanese coffee shop of the 50s, inspired by Italian Neorealist films like “Miracle in Milan” or “Rocco and His Brothers”. 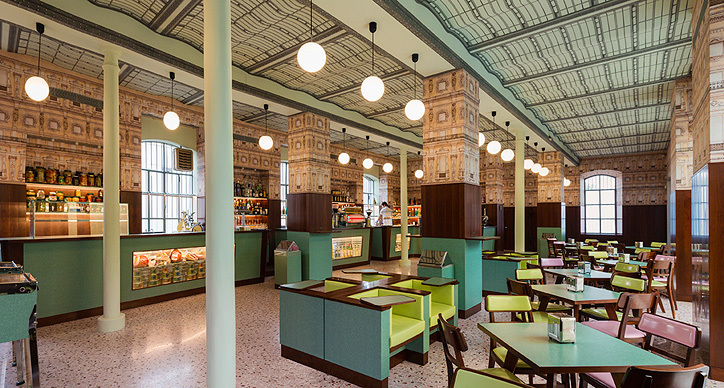 Pastels, formica tables and veneered wood walls are integrated in some architectural and decorative details of the original structure. The result is the quintessential of the director in a real set. Wes Anderson’s obsessions are developed here in color saturation, symmetry aesthetic and retro vintage furniture, to express how nostalgia and anachronism can be extraordinary modern, as seen in Life Aquatic or Moonrise Kingdom. You can listen to the imaginary voice of a storyteller, just as in the beginning of his films, in which the sounds are mixed with Britpop music coming out the jukebox, echoing the inspiration of the 60’s. 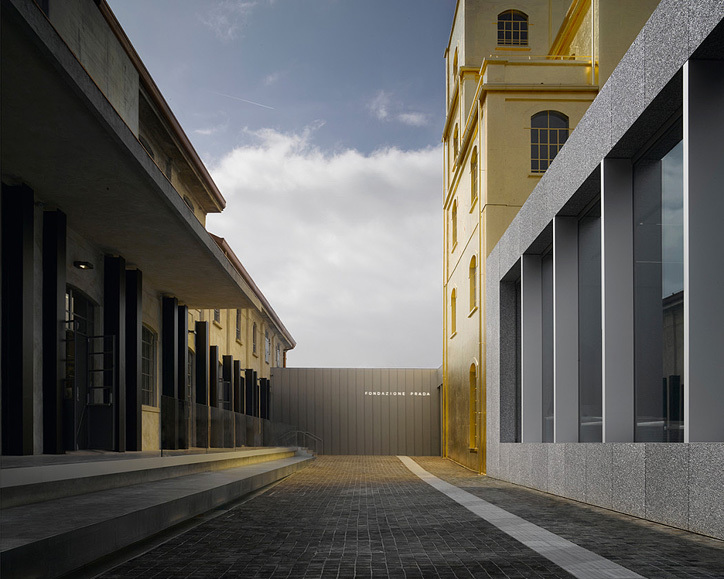 Fondazione Prada is an extended contributor of cultural activities in Milan. A space located in the south of the city, promoted by the influence, the intelligent interests and the alliance between art collectors and Prada, a modern Renaissance dream come true in every single exhibition. 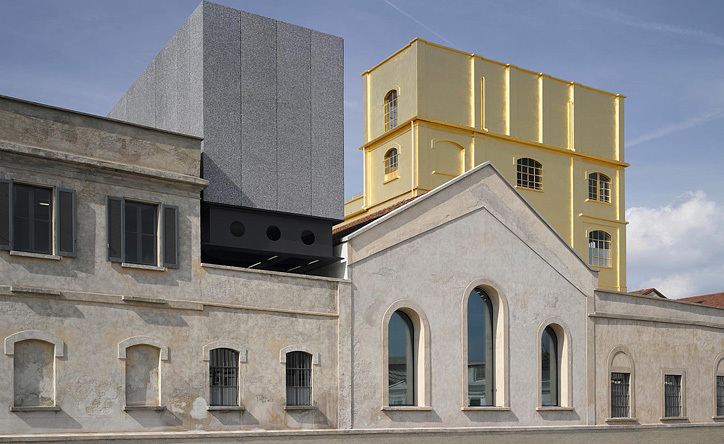 Housed in a 1910s distillery, Fondazione Prada’s golden structure reflects the brand’s grandiloquent search of beauty through the years. Milan is a permanent cultural spot, where just even by walking down the streets you can admire all those façades that show the traces of decadent style, and the vibration of the ancient decades passed over generations of renewed aesthetic lovers. It’s praiseworthy that such an institution enriches and embraces different activities, exhibitions and places like Bar Luce, which is a gift for the eye, a deep impact on the sensibility and the perception on art, fashion and gastronomy. Previous PostBernard Plossu / El viaje va por dentro. Next PostMistura / Felicidad helada.